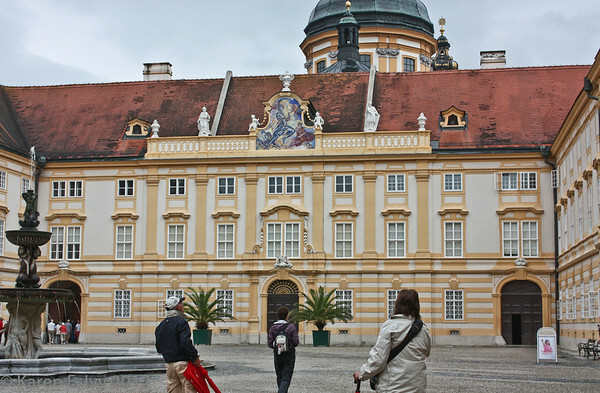 Melk Abbey is a famous Benedictine abbey in Austria, in the town of Melk on the Danube River. (Well, famous to the cognoscenti; I never heard of it before the trip.) I can’t give you the panoramic photo from across the valley because, first, we never saw it until the buses dropped us in the parking lot, and second, the day we visited, it rained buckets, off and on. Here’s a view of the town and the river, from the walls of the abbey, part way through the tour. If it looks as though rain is pouring down, it is. 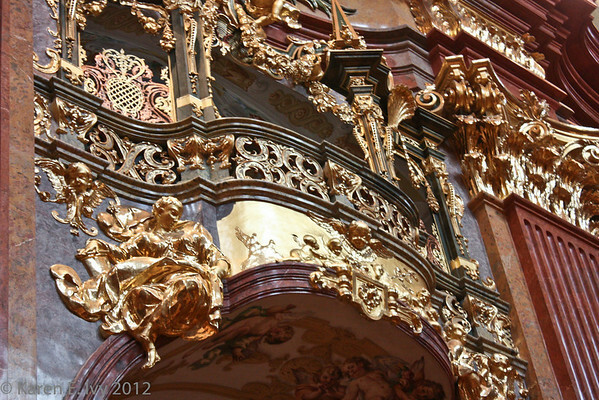 Melk Abbey is one of the most ornate Baroque constructions we visited – and I do include the Prinz-Bishop’s Residenz in Würzburg. Also, it’s huge. Wikipedia doesn’t say how many monks reside there, but my notes from the tour say it has 33 monks. Wikipedia does say the school managed by the abbey has approximately 900 pupils of both sexes. The monastery was founded in 1089 but the present abbey was built in the first third of the 18th century. As a medieval institution it was a major scriptorium, that is, a place that copied books. Its library and collection of medieval manuscripts are vast, but they wouldn’t let me take any photos of the library. Drat. I will say all the library shelves were covered by what looked like wrought-iron gratings. 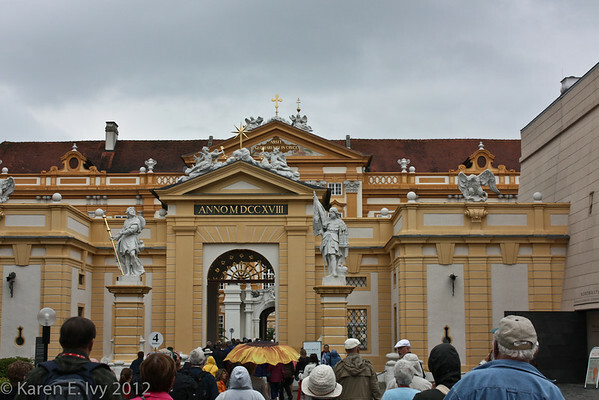 I’m just giving a sample of photos here, there are more in my gallery Melk Abbey. Here we all are, approaching the first entry; the rain was just starting to come down. 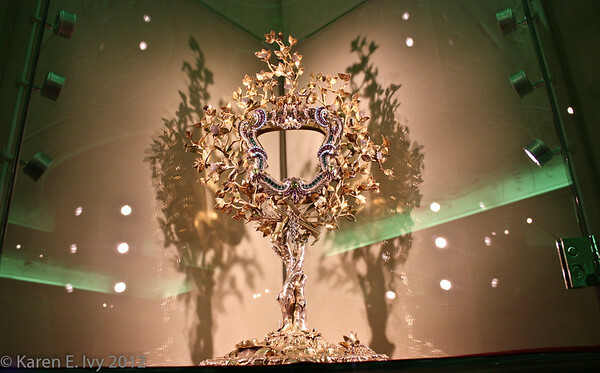 Back to the museum – in a room which was lighted in green, we saw one of the monastery’s most precious relics, the Coloman Monstrance. You can look up monstrance, but basically and without the theological trimmings, it’s used in the Catholic mass to display the blessed Eucharist or host to the congregation. That’s what the hole in the middle is for. This monstrance is particularly holy since it is reputed to contain St. Coloman’s lower jawbone. 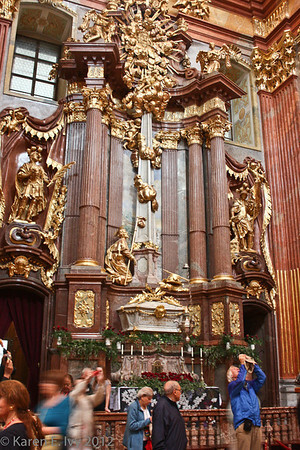 As you’ll see in some later photos, Melk Abbey is unusually rich in actual physical relics of saints. Or so they think. No student of medieval relic trading is anything but cynical about those bits of bone. 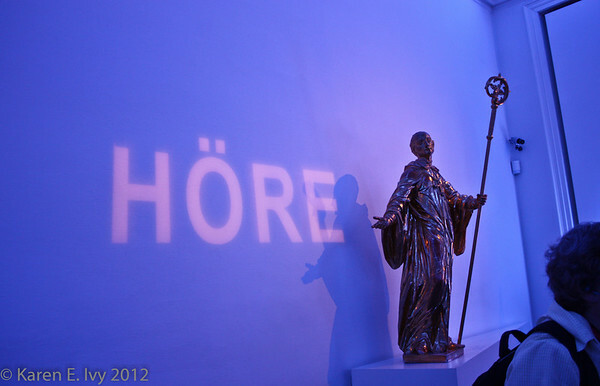 The rest of the museum contained statues, more relics, and some examples of formal ecclesiastical clothing. 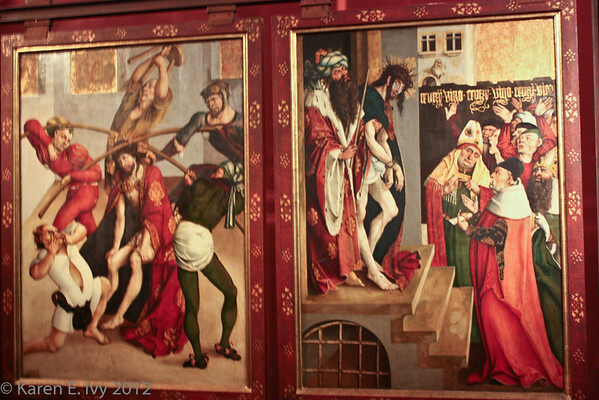 They also had some late medieval art works, including an interesting multi-panel altar screen which I would put at 15th century. When the tour guide called it an “altar” I gave up on her as a source of factual information. Here are two of the panels. In another room, they had what must have been the chest they kept the money in. 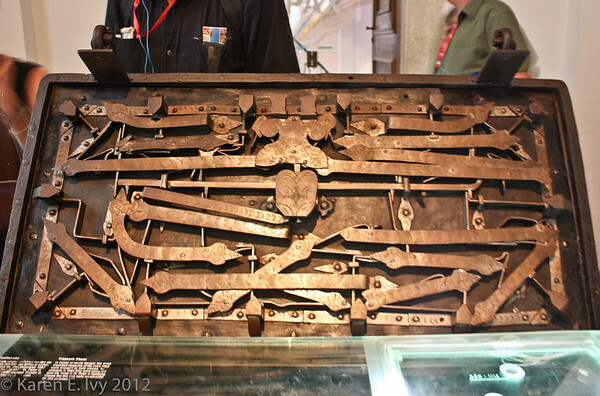 I don’t think I’ve ever seen a lock this elaborate. I think that’s the key under plastic in the lower right corner. When we left the museum we went into the Marble Hall. Take a look at the photo below, especially the painted ceiling. Now let me throw you the curve. That room has a flat ceiling. Yes, it does. It also has one of the most amazing examples of trompe l’oeil painting I’ve ever seen. All those beautiful receding curves – painted. It also has beautiful stone and gilt work on the walls. I don’t know if all that stone is marble or just the red stuff; we didn’t get a lot of detail. 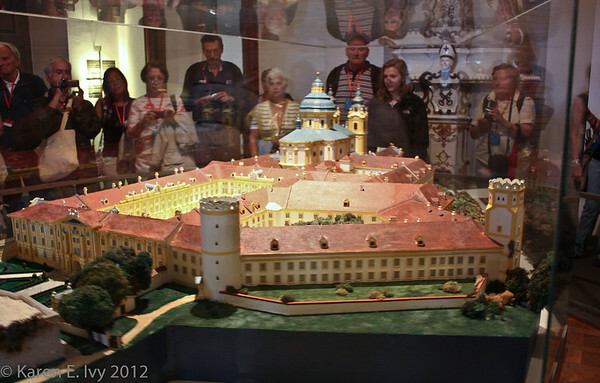 We also saw a 1:100 scale model of the entire abbey. Notice the watch towers at the corners. In the Middle Ages, abbeys sometimes had to be defensible; but by the early 18th century, round watch towers were just conspicuous consumption, or possibly storage. 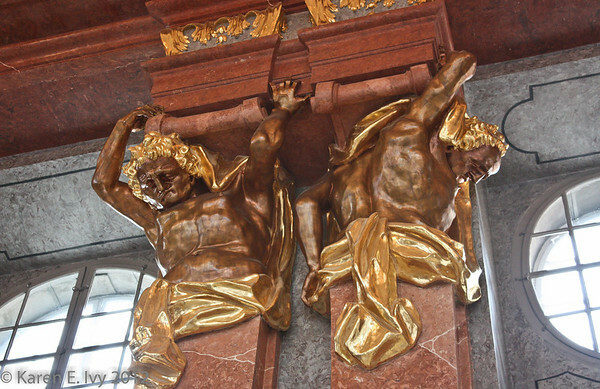 I’ll include some other details, but I want to share the oddest thing I saw at Melk – or for that matter on the trip. 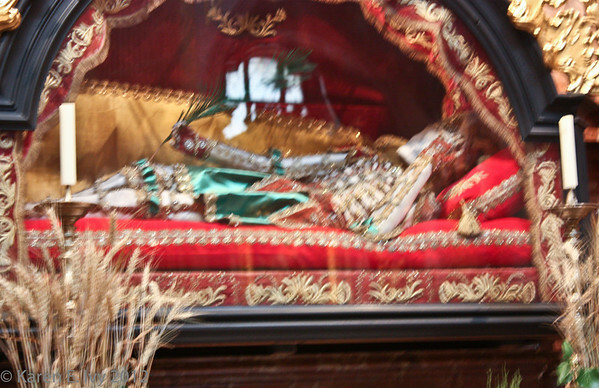 As best I can see, that is a mummified human body, dressed in what looks like 17th century satin clothing, embroidered in gold, lying on embroidered pillows. It was not labeled; I have no clue who it was. It was fenced off so I couldn’t get very close. There are actually two of these in the church, in different clothing; this is the best picture I got, there’s a fuzzy shot of the other one in the gallery. We saw other preserved human bones in a church in Regensburg. 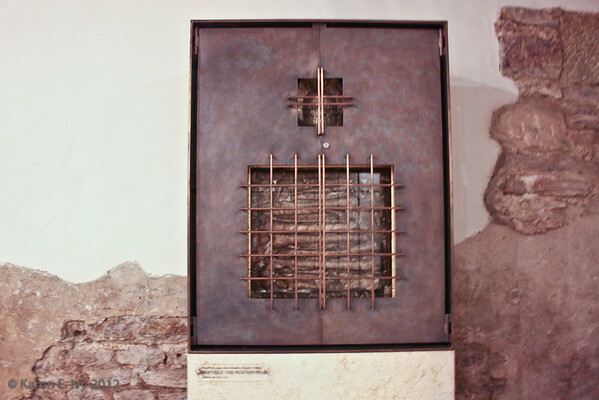 They display the bones of Berthold von Regensburg, a well-known itinerant medieval preacher, in the church crypt. But that’s a much more spartan display. I know that people of note were often buried in churches, but I had no idea they were mummified and preserved under glass. Very odd indeed. If anybody knows more about the mummy under glass in Melk, please contact me. I don’t think the body under glass is a saint. 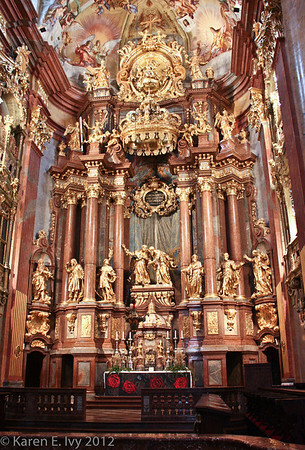 Now, this elaborate secondary altar, with what looks like an alabaster sarcophagus decorated in gold, is much more typical for the resting place of a saint, and is in fact said to be the tomb of Saint Coloman – except, of course, for his jawbone, which is in the Monstrance (see above). By this time all the gilt was becoming overwhelming, but we weren’t done. Turn to your left from St. Colomon’s tomb, and there is the high altar, where mass is said. I was charmed to see the little balcony below, convenently located directly opposite the pulpit. If I’m right, this is a private viewing booth, for use by a well-to-do and/or noble family wishing to attend mass without having to mingle with the hoi polloi on the church floor. It might also have been used by a family in mourning. On the way out we saw an absolutely gorgeous clock, made entirely of wood including all the gears. 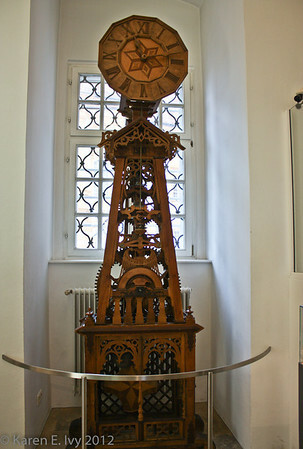 This is the size of a grandfather clock but without the case. 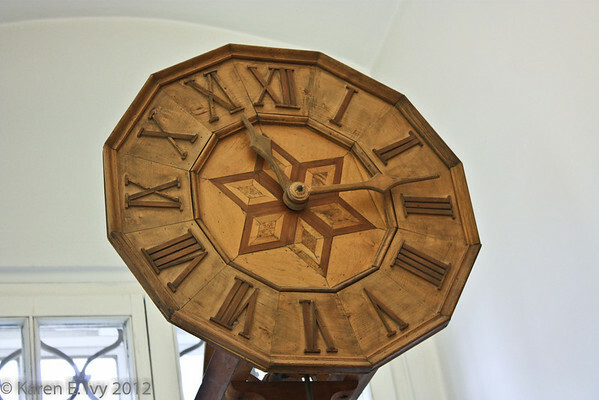 The inlay work on the clock face is exquisite. And with these two photos I’ll close this post. 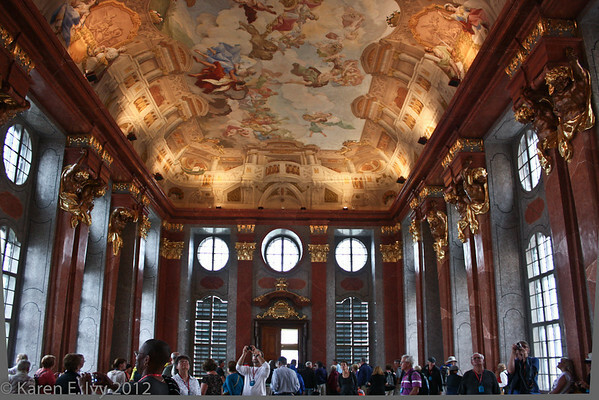 Thank you for sharing your trip to Melk Abbey. 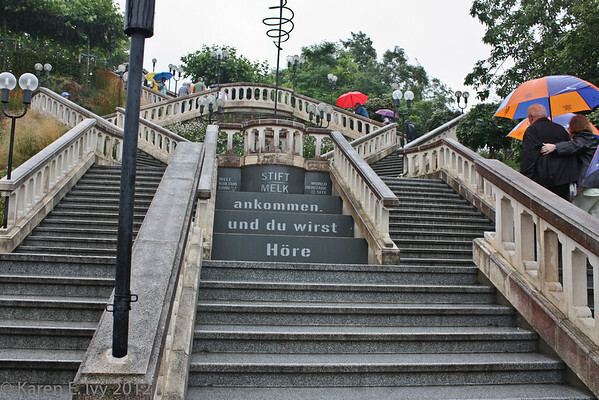 I was there last month (on Sunday, May 11th). Your photos and commentary brought back fond memories of my visit (except for the rainy day, which I see you also had on your visit). 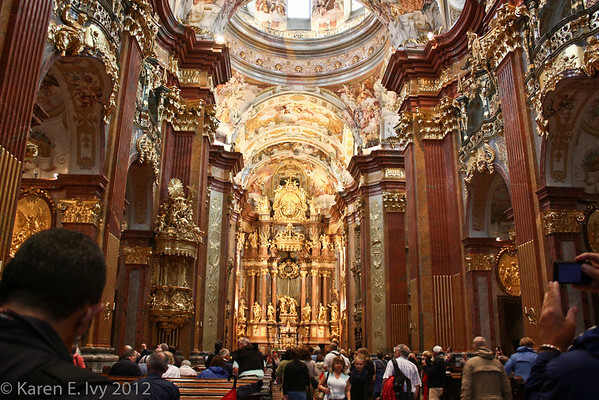 I think Melk Abbey is a must see for anyone traveling in that part of Austria. It’s quite unforgettable. Glad you enjoyed the photos, Roger. Yes, Melk is amazing. I was disappointed that they wouldn’t let me take photos in their library! I have photos taken inside the library which I can email to you if you wish. I did the tour in 2008. Narelle, how kind of you to offer. I’d love to see them. My email address is at the menu link Karen Ivy’s Home Page, above. 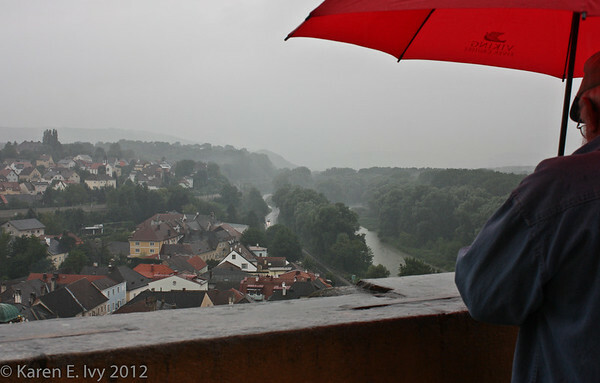 Thank you for sharing your trip, my wife and I spent half of this last December in Melk, Austria. My step son is a senior at St John’s Prep in Minnesota but for this entire school year he has been one of those 900 students at the Melk Abby. The two Abby’s have had an exchange of students since the late 50’s it is a wonderful program and a very special place. 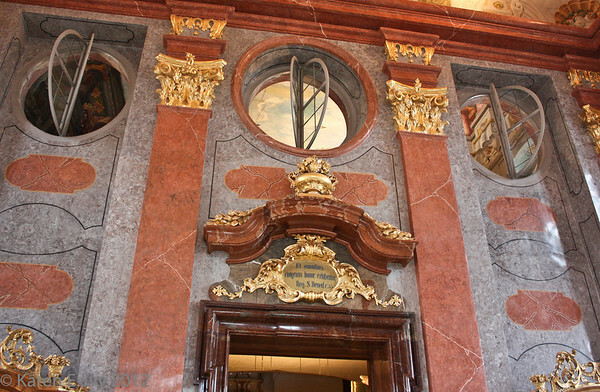 The remains under glass were actually gifts from Queen Maria Theresa as was the entire Abby. The “Stift” means Gift the queen gave the Abby and grounds to the monks as a gift. Wow! Also, as you leave the Abby and walk down the hill and reach the road look right across the street there is the best bakery you could ever imagine right there.